We've invested in the technology to make exam findings easier and more accurate for everyone from toddlers to seniors. In 2 separate reviews by a consumer magazine over the past 5 years, we were rated one of the best in Chicagoland with 91% and 92% overall patient satisfaction. 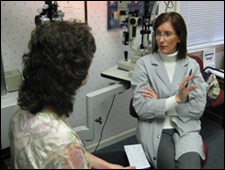 Medications and systemic conditions such as allergies can affect the vision. Your current glasses or contact prescription is verified by computer analysis. 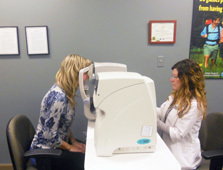 This technology automatically determines your glasses prescription. Because the doctors know the answers prior to seeing you in the examination room, the number of questions ("Which is better, one or two?") is significantly reduced. This is especially helpful for small children and elderly patients. This is the latest in the "puff" test to measure the pressure inside the eye for glaucoma. This puff is much softer than previous versions. However, we have two other entirely different "non-puff" methods to measure the pressure in the eye. Color Vision -- If there is a congenital color deficiency, we will advise accordingly. 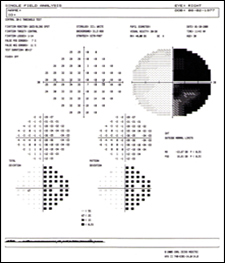 Acquired color deficiency means that there may be damage or swelling to the optic nerve. Muscle Imbalance -- Proper eye positioning may also be the cause of headaches and poor reading skills. 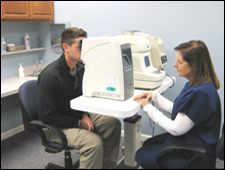 Peripheral Vision -- Peripheral or side vision is measured. Depth Perception -- This evaluation gives us an indication if the eyes are working together. 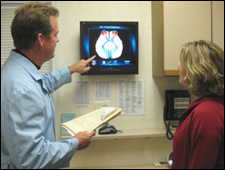 Laney performing the necessary preliminary testing before the patient is seen by the doctor. 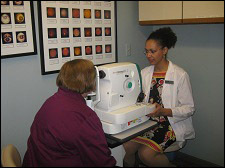 Carol performing corneal topography on a contact lens patient who has astigmatism. 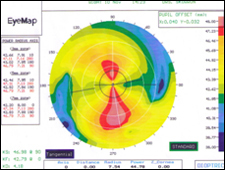 Note the vertical red "bow tie" on the corneal map on the right. That indicates a very steep slope. Whereas, the green section indicates a very shallow slope. This accurately confirms that the cornea (front of the eye) has two separate, distinct curves, which need to be taken into consideration when properly fitting a contact lens. 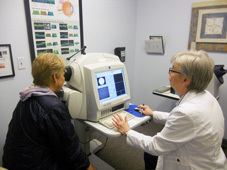 The doctor Verifies the readings of the autorefractor and makes any necessary adjustments to come up with a final, accurate prescription of your glasses and/or contact lenses. 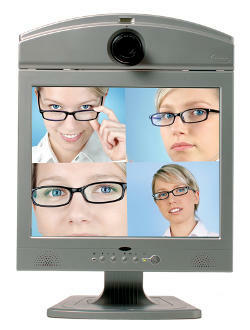 The doctor will assess the focusing and eye-tracking ability, which is especially important with children. Poor tracking and focusing can cause of poor school performance. 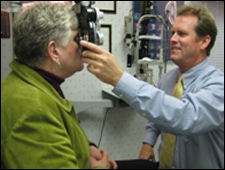 The doctor takes a high powered magnifying lens and evaluates the structures around, inside, and in the back of the eye. Depending on the circumstances, that doctor may wish to dilate the eye then or at a later, more convenient time. 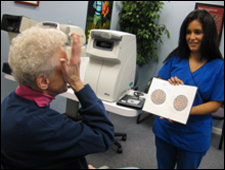 Diagnosis and management of macular problems, glaucoma, and more! This instrument actually splits and allows us to see the individual layers of the optic nerve and macula. Diane performing an OCT on a patient. 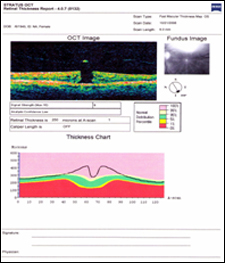 This instrument is the gold standard in diagnosing and following glaucoma. It is also useful to monitor and detect subtle macular changes from age and from certain medications used for rheumatoid arthritis, such as Placquenil. 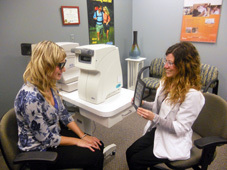 High-resolution camera enables accurate diagnosis and documentation of many eye conditions. Comprehensive preoperative and postoperative laser evaluations ensure that you are a good candidate for laser vision correction (LASIK). We have evaluated THOUSANDS of cases. For various reasons, we advise approximately 20% of patients interested in LASIK to not have the procedure because they are not good candidates. 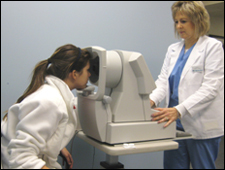 Poor laser vision results most commonly occur in those patients who were poor candidates. 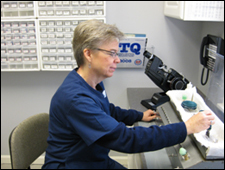 We provide on-the-spot polishing and/or adjusting of gas permeable lenses. 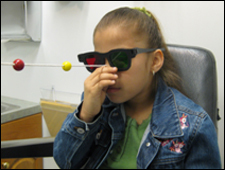 Eye exercise programs for children are designed to treat AMBLYOPIA (lazy eye), focusing difficulties, poor eye coordination, and muscle imbalances. These conditions can all lead to headaches, eye strain, and poor reading and learning skills. We have programs and equipment designed for home use to ease any financial burden. The large modern dispensary has over 1500 affordably priced frames from which to choose. We will gladly special order any frame of your liking. 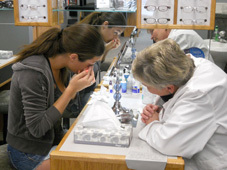 Experience staff (over 125 combined years) helps you choose the right styles and lens options, SPECIFICALLY FOR YOU! We have an absolute, no questions asked, 1-year warranty on all glasses. 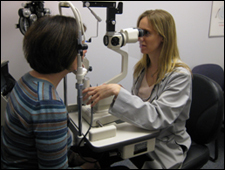 Prescription and nonprescription eyewear are available. 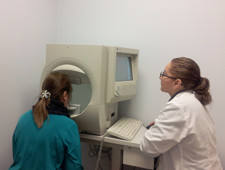 The on-site lab offers immediate service if needed. On-the-spot repairs can be made. The best non-glare applications don't smudge, scratch, and stay clean. Having trouble seeing yourself in new glasses? Choosing new glasses can often be a struggle because patients cannot see themselves in the mirror when they take off their own prescription glasses to try on a new frame. We have the newest technology that solves that problem! Stop in anytime to browse our large frame selection, and one of our opticians can help you by taking your photo in several different frames and doing a side by side comparison right on the computer screen. Thanks for viewing our frame gallery. We would be honored to care for you and your family.